Birthplace : Avon, South Dakota, U.S.
George Stanley McGovern, a U.S. senator since 1962 and an early opponent of the war in Vietnam, was the unsuccessful Democratic candidate for president in 1972. George McGovern was born on July 19, 1922, in Avon, South Dakota, a son of the Middle Border—the great prairie region steeped in agrarian, small-town, churchgoing ways and in populist liberalism and hope. His father, Joseph McGovern, a Wesleyan Methodist preacher, was stern about faith and morals and regarded drinking, smoking, and dancing as temptations to be fled. Joseph McGovern's last pastorate was at Mitchell, South Dakota, where George attended school. George's formative years were shaped by the Puritan ethos of work, self-restraint, abstinence, sacrifice, and inner discipline. He was a shy, bookish boy, but he discovered himself in high school debating and was so good at it that he got a scholarship to attend Dakota Wesleyan University in 1940. At college McGovern wooed a girl he had met in his high school debating, Eleanor Stegeberg, whom he later married. In 1942 he enlisted in the U.S. Army Air Force; he flew 35 missions in Europe as a bomber pilot, although he hated flying and did it only because of his sense of duty, and he was decorated for valor. After his discharge in 1945 McGovern was torn between history study and the ministry. Feeling drawn to the Social Gospel movement of Walter Rauschenbusch, with its emphasis on applying Christian ethics to practical life, McGovern entered a theological seminary in 1946 and became a student minister. He left after a year to do graduate work in history at Northwestern University, receiving his master's degree in 1950, and then taught at Dakota Wesleyan until 1953. That year he received his doctorate from Northwestern with a socially conscious dissertation on the Colorado coal strikes and the "Ludlow massacre" of 1914. The Northwestern years were the watershed for McGovern, turning him into a strong believer in the Democratic left. But in 1948 he supported the Progressive party candidacy of Henry A. Wallace and was a delegate to their convention—where he encountered a "fanaticism" that troubled him, and in the end did not vote. But his anti-cold war liberalism continued, his national and world horizons broadened. McGovern became executive secretary of the South Dakota Democratic party in 1953, a year of low Democratic morale, in a state where the party scarcely existed; he served until 1956, when he was elected to Congress. He was reelected in 1958. After he lost a senatorial race in 1960, McGovern was director of the Food for Peace program (1961-1962) and then ran again for the Senate and won. In January 1965 he made a major speech in the Senate against the war in Vietnam and thereafter was a leading dove. When Allard Lowenstein, the organizer of the movement to dump President Lyndon Johnson, asked McGovern to challenge Johnson in the 1968 primaries, McGovern refused, preferring to focus on reelection to the Senate. After Robert Kennedy's assassination in 1968 McGovern entered the convention struggle belatedly against Hubert Humphrey and Eugene McCarthy, and while he made little delegate impact he grew certain of his future course. On Jan. 18, 1971, McGovern announced his candidacy for the presidential nomination with a pledge to remove all American troops from Southeast Asia if elected. In the 1972 primaries, despite all the polls, McGovern came up from behind—using a populist appeal on taxes and other reforms as well as a sharp antiwar stand—and captured the Democratic nomination for president at the Miami convention in July. In the election he and his running mate, Sargent Shriver, were defeated by Republicans Richard Nixon and Spiro Agnew; McGovern received 38 percent of the popular vote and carried only Massachusetts and the District of Columbia, with 17 electoral votes. After this crushing defeat, McGovern was reelected to the Senate in 1974. He lost the seat to James Abdnor in the 1980 election. McGovern again tossed his hat into the presidential ring in 1983, when he announced his candidacy for the 1984 Democratic nomination. His main campaign issues would be promoting a national health care system and decreasing the military's budget. He ended his bid after trailing in early primary elections. Although McGovern considered running for president again in 1992, he never did again. In 1991, he took over as head of the Middle East Policy Council, an organization dedicated to better public understanding of the region. He made several trips to the Middle East in conjunction with this responsibility. In 1993, he submitted a proposition to President Clinton calling the United States to protect access to Arabian oil by cracking down on Israel for its failure to end conflict with Arab countries. In 1988, McGovern fulfilled a lifelong dream by purchasing the Stratford Hotel in Connecticut. He owned the hotel for two and half years. The hotel went out of business in part because of two lawsuits brought against McGovern by guests that were injured on his property. As a result, he began to believe that the existing law made it too easy to bring lawsuits against business owners. In several magazine articles and newspaper editorials, he called for tort reform. It was very unusual position for a lifelong liberal to take and McGovern was criticized for this by consumer advocate Ralph Nader. McGovern wrote about political subjects throughout his career, publishing numerous articles, and the books War Against Want in 1964, and A Time of War, a Time of Peace in 1968. In 1996, he published Terry: My Daughter's Life and Death Struggle With Alcoholism, a frank discussion of the circumstances that led his daughter to freeze to death after a night of heavy drinking. The book was a moving portrait of his daughter, and the impact of his career on her life. It was widely reviewed and received excellent notices. 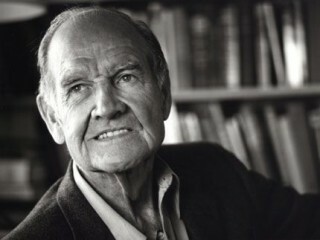 View the full website biography of George McGovern.